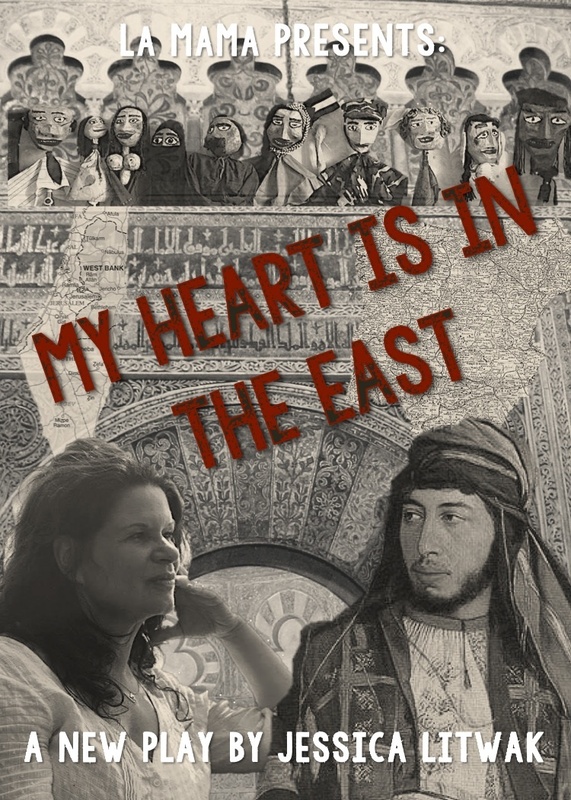 My Heart is in the East takes place in two realms: Present-day Iraq and Medieval Spain where spoken word poetry contests contributed to communication and where Muslims and Jews lived in a state of coexistence and vibrant cultural exchange. In New York a Jewish American professor (Miri) receives an invitation to Basra, Iraq to lead a series of puppet building workshops. An Iraqi Muslim (Ishmael) a street poet who is currently employed as a mercenary gravedigger is hired to be her translator. Both are resistant to the idea of the other. When Miri arrives in Iraq, Ishmael’s fury at America drives his poetic aggression towards her. She is simultaneously terrified of him and dependent on him for language and protection. She is plagued by writer’s block where he spews poetry like water from a fountain. Their relationship grows more discordant and they part as adversaries when she returns to the States. Relations become more complicated still when the onslaught of war at home causes him to have to swallow his pride ask her for help. She gets him to Beirut as a refugee. There, when they can no longer escape the conflict that is chasing them, they dive into Miri’s favorite story (and the subject of the book she has been trying to write), the tale of two poets 1,000 years earlier in Cordoba, Spain. verse. Abu and Aviva meet and slowly become friends as they conquer gender power dynamics and religious differences, to teach each other the poetic tools of their divergent cultures. They grapple with a poem he is struggling to write as he slowly allows himself to be taught by a woman. They plot how to get Miri to the contest disguised as a man and she does the unthinkable by dressing in Abu’s clothes and rehearsing her poems as a man. They are filled with the joy of writing and the intellectual romance of sharing each other’s words. Finally, circumstances force them apart and as they end their brief but intense encounter the world shifts back to the motel room in Beirut and Miri and Ishmael find themselves back in the 21st century, the problems of the world escalated even further. Nothing has changed for them in the world, yet inside them everything has changed. Potential post and pre-show community events include The Poetry Contest where the audience engages in the same creative experiences as the characters in the in the spirit of ancient Cordoba, and the subsequent discussion often led by a community leader, is geared to inspire and provoke meaningful dialogue and exchange. There are also opportunities for extended workshops in connection with production including puppet building (Litwak teaches how to build the puppets with brains as she demonstrates in the play where she builds a puppet onstage during the action) performance and peacebuilding, and poetry workshops. Why this piece and project now? We are in a time of increased Islamophobia, Anti-Semitism, Xenophobia, cultural division and anxiety. Through history we can re-frame the present and re-shape the future. There was a time when Jews and Muslims lived together harmoniously and the Arts and Sciences flourished. This is not a story widely told. In North American culture spoken word poetry, rap (and its musical association to hip hop) has emerged as a pre-eminent contemporary art form over the last 40 years. 1000 years ago, in Cordoba spoken word took the form of poetry contests in which Arabic and Jewish poets would compete in poetry battles that mirror scenes from contemporary poetry jams. In this piece, we show how the poetry itself leads to connect and how the love of language allows people to reach across the chasm of culture, religion and gender to experience coexistence that is both vibrant and true. Dialogue is fundamental to communities getting to know each other, moving beyond the other and mere co-existence. MHITE crosses a number of divides to open up the possibilities of dialogue in the minds of the audience: East / West; ancient / contemporary; women / men; Muslim / Jew – with insight, wit, humor and the transformative power of language. The play leads us into the post show conversation so that the audience both witnesses and experiences the potential connection to the other that dialogue can bring. Cordoba thus becomes a code for creative coexistence and efforts towards social justice and peace. We plan on taking this piece to countries where the conversation about Jewish – Muslim relations is immediately necessary. We have received interest from theatre and human rights colleagues in Berlin, Tel Aviv, Jenin, and Spain. Jessica Litwak, (playwright, Miri, Aviva) an Internationally recognized leader in socially engaged theatre is an actor, playwright, and puppet builder. She is the Artistic Director of The H.E.A.T. Collective and the founder of Artists Rise Up New York. Fred Fortas, (Ishmael, Abu) an actor born in Algeria and fluent in French, English, German and Arabic, has worked extensively in theatre, film, radio and television in England, France and around the world. Jonathan Meth (director) is a dramaturg, script editor, and lecturer, and has directed over 20 UK productions. He founded and curates - The Fence – a network for 250 playwrights and cultural operators across 50 countries. Rosalind Parker (interfaith cultural liaison and team member) is a researcher and practitioner in the area of religion and aesthetics, and has worked for London Jewish Museum and the Women’s Interfaith Network. She was the Artistic Director of ‘Ulfah Arts and Media’, a Muslim women’s social enterprise. The genre of MHITE is magical realism: music, puppets, and projections carry us through time and space. Audience members have said: “This play is a celebration of language; the language creates the space.” And: “I understood that people could live on poetry.” Key to the play’s dramaturgy and authenticity is the need for a female Jewish actor and male Muslim actor. This is a play written in New York, from New York, but reaches Eastwards. Paris is the city with Europe’s largest Jewish and Muslim populations and London acts as a bridge between the European land mass and the UK’s shared language with the USA. This company stretches across three great theatre cities, and brings together three nationalities, two religions, two genders and one goal: to develop a production that is provocative, moving and entertaining. The aim is to inspire and advance the conversation about Jewish-Muslim relations in three ways: 1. By offering a beautiful, deeply felt and well- acted production of a poetic and dramatic duet between a Muslim man and a Jewish woman. 2. By providing an opportunity for community engagement with a poetry contest and discussion after every show. 3. By reaching out to the Jewish and Muslim communities who could benefit from this experience. We bring extensive experience of community based engagement, and we will use this as part of our audience development strategy, tapping into different communities of interest, working in partnership with key gatekeepers. Graeae Theatre, all of which provided great post show discussions. These opportunities enabled them to deepen the dialogue and facilitate Jessica’s rewrites. They widened the circle by bringing Fred into the mix and had a series of Skype sessions between London-Paris and New York. The three have met in London twice, working on the play for an intensive workshop, which included play readings, in depth discussions, a puppet building workshop and production strategy. They have continued to collaborate on the script across time and space, inspired by the subject, the script and each other. This fall then brought Rosalind to the process to strengthen the interfaith aspect of the play’s outreach. The build has been an organic, iterative collaboration.